Hi Lovelies, Congratulations on your upcoming wedding. 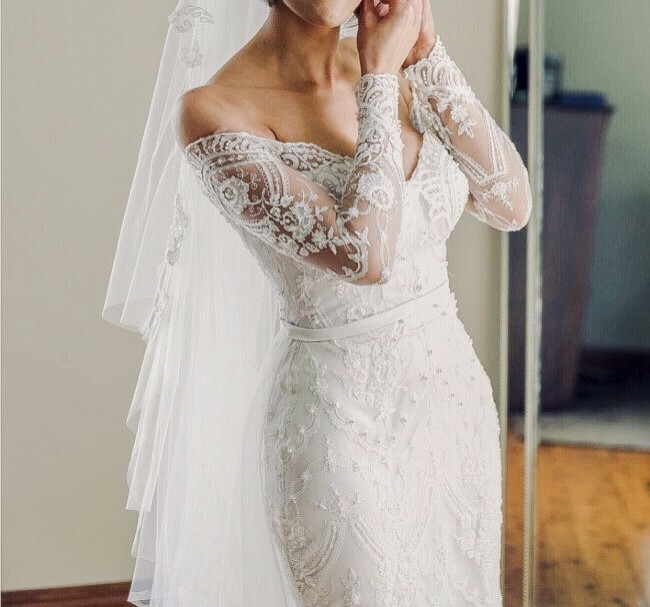 For sale is my beautiful ivory french lace Norma Bridal Couture October 2017 Wedding dress with an off the shoulder, sweetheart neckline, finest french long lace sleeves and intricate beading detail. It will fit a size 6-8 dress size with a size 10D Bust. If you have any questions, would like more pictures or would like to give it a try, you can message or contact me below. Length of sleeves 56cm Length of lace train 1.5m Skirt is also included - this is detachable and can be taken off for the reception. The skirt is a plain sheer material and detaches under the belt. Dress was $8500 Dress includes Skirt. Veil not included. Please note - Elastic has come off around the edges of the arm area to hold the dress up. there’s also a little hole under the arm. A savy dress maker or alterations assistant would be able to take in / adjust according to your size, adjust beading and fix etc.